How to make HTML5 videos for iPad playback? *In this easy iPad HTML5 video tutorial for beginners, we assume that you have iPad HTML5 video player installed. If not, you can download the html5 video for iPad tool here. Launch the iPad HTML5 video converter. Drag and drop your video file into this application. Repeat this step to add other videos if need. You can click to select a video clip then click the UP or Down button to rearrange the video playlist on the left. You like a stylish video player for your HTML5 iPad video display, right? Now click Theme tab to open up the video player theme list. It is time for video size now. 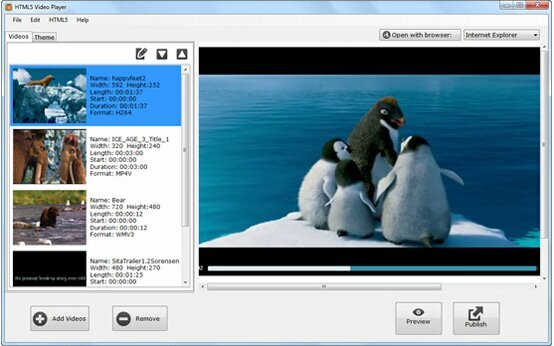 This HTML5 video player allows users to customize video/player size for best display result on different devices. Bear in mind you may get conceptually different UI than desktop browsers if you browse your html5 video from mobile devices due to their touch controls, small screens and hardware buttons. Now we are ready to publish the HTML5 iPad video. Hit the Publish button on the lower right corner. Go to the top menu bar, click HTML5 >> Open Output Folder, here you get your iPad HTML5 video player files. Upload them to your server via whatever FTP program you use. Load the HTML5 video on your iPad web browser. You are done! Now you know how to convert your videos to HTML5 videos and customize them with beautiful players for the playback on your iPad. Want to try it by yourself, free download this iPad HTML5 video program bellow.